Guallarauco’s golden carica—a papaya variety—is cooked in beet-sugar syrup for a sweet, nicely chewy snack ($9; cortibros.biz). Distilled in Kazahkstan, the supersmooth Snow Queen Vodka is poured at Blackbird restaurant in Chicago ($27; snowqueenvodka.com). Tiny holes let light pass through British designer C.J. O’Neill’s Solas Coinneal "Pierced Gold Leaf" bone-china bowls (from $140; 214-242-5110). Wine importer and F&W contributing editor Dan Philips paired up with designer Chuck House to create brilliant wine labels that mimic airline boarding passes. Grateful Palate Airwines’ 2005 Boarding Pass Shiraz ($15) and 2005 First Class Shiraz ($30) have lush fruit notes (888-472-5283). 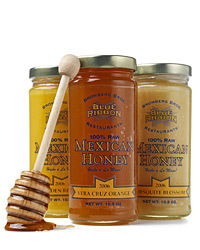 Chef Felix Vaquero of New York City’s Blue Ribbon restaurants is especially close to one of his suppliers: His extra-thick, intense-tasting Mexican honeys come from his father’s farm ($12; blueribbonrestaurants.com). Mepra, an Italian company known for its stainless steel flatware, oddly enough has a background in bullet manufacturing. Its new Fantasia Millennium flatware, with nylon-glass handles in 18 mix-and-match colors, is decidedly more pacifist ($49 for a five-piece setting; lekkerhome.com).